Blog to End the Occupation: Can Israel survive its 45-year occupation? Can Israel survive its 45-year occupation? Nadia Hijab is Director of Al-Shabaka: The Palestinian Policy Network. She serves on the advisory board of the US Campaign to End the Israeli Occupation. This week marks the 45th anniversary of Israel's occupation of the West Bank, Gaza, and East Jerusalem. A decade ago, I joined a small group of Americans in identifying the occupation as the Achilles heel in Israel's decades-old violations of Palestinian human rights. We believed that hard work and our diverse ethnicities, faiths, and ideologies, grounded in a common commitment to international law, would soon get the "end occupation, uphold human rights" message out to the political establishment and fellow Americans. After all, there was international consensus concerning the "inadmissibility of the acquisition of territory by war," a basic principle of international law enshrined in U.N. Security Council Resolution 242 of 1967, which called for Israel's withdrawal from the territories it seized in the 6-day war it launched on June 5. Even though the organization we co-founded has since grown to represent hundreds of thousands of Americans, the Israeli occupation appears more entrenched than ever. Israel has cemented its control of Palestinian land and water, settling over 500,000 of its people in the territories and herding the Palestinians into ever-smaller enclaves, all the while flagrantly violating international law. Yet it has continued to enjoy the support of the United States, including diplomatic cover at the U.N. and massive military aid. 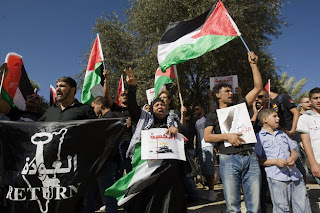 Israel has also benefited from the acquiescence of the Palestinian Authority and Palestine Liberation Organization in the moribund "peace process" launched by the Oslo Accords nearly 20 years ago. Although this so-called leadership now refuses to participate in negotiations so long as Israel continues to colonize, they have not definitively pulled out of them, even though the only tangible result has been the inexorable loss of Palestinian land and rights. Worse, they have no clear counter-strategy and have not been willing to invest in the sources of power necessary to achieve Palestinian human rights, even though there are many avenues available -- diplomatic, economic, mobilization of Arab and international civil society -- that could effectively challenge Israel. Join TIAA-CREF Vigil in Chicago! Make Up Your Mind, ADL!